And John Kurrien in the Times of India citing an Educational Initiatives study of 35,000 Class 2, 4 and 6 students in 300 municipal schools in 30 towns of 5 states, indicating that more than two-thirds of Class 4 children were unable to divide 20 by 5; and more than half of Class 2 students were unable to match an alphabet letter with its sound -­ a skill mastered by most children attending an average private pre-primary school. We must bear in mind that the parents who send their children to a municipal school are essentially domestic workers, rickshaw drivers, street vendors and other stalwarts of the urban informal sector, whose ONE aspiration is that their daughter or son will NOT follow in their footsteps, but get the education and skills to procure a secure, permanent and well paid job in the formal sector. And this is exactly the type of student that programmes like Skill India should be targeting. But if the municipal school education is as abysmally poor as the above report suggests, how successful will the government’s ambitious vocationalisation efforts be? Not very… and there goes India losing its demographic dividend, while countries like China and South Korea forge right ahead, especially in the small, medium and heavy manufacturing sectors. 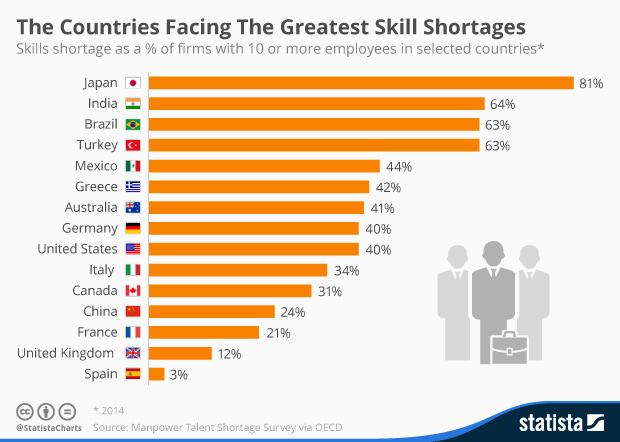 While Japan may suffer a skill shortage because of the increasingly sophisticated technology of its industry coupled with an aging population, ‘younger’ countries like India, Brazil, Turkey and Mexico need to get their educational act together, if they are to overcome their respective skill shortages and the ensuing informalisation and deprivation of their urban economies.